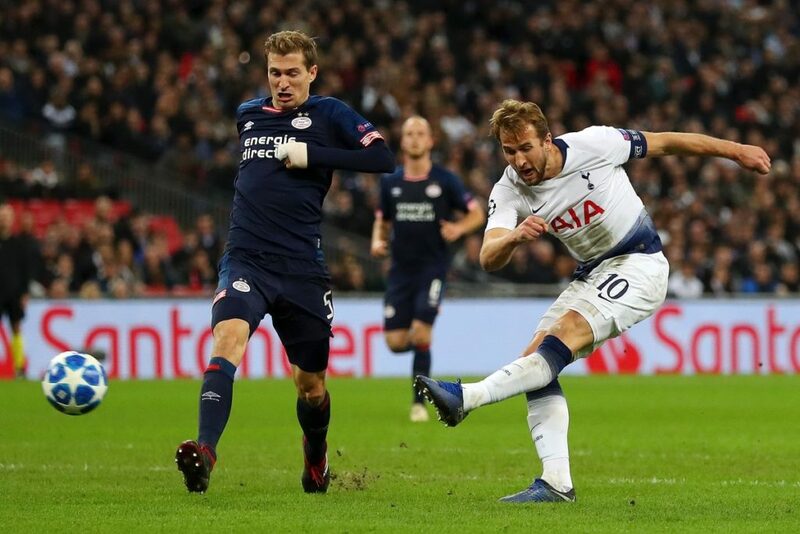 Harry Kane kept Tottenham Hotspur’s hopes of qualifying for the knockout rounds of the Champions League alive after they beat PSV Eindhoven 2-1 at Wembley Stadium on Tuesday evening. Spurs’ pressure eventually told in the 78th minute as Kane got the equaliser and he then had a major role in the winner as Trent Sainsbury deflected the England striker’s header past the despairing Zoet, teeing up Mauricio Pochettino’s men nicely for two huge clashed with Inter and Barcelona. For the rest of the first half the home side were dominant, but Zoet in PSV’s goal was in fine form, making a brilliant double save to deny Christian Eriksen and Alli in the 28th minute. Spurs remained the controlling force after the restart, but they almost found themselves two behind in the 58th minute – Paulo Gazzaniga crucially stopping Gaston Pereiro’s goal-bound header from a corner. PSV’s resistance was finally broken Kane found the bottom-right corner with a left-footed strike following a Fernando Llorente knockdown. Following late drama in both Group B matches, Inter’s trip to Tottenham at the end of the month suddenly takes on even more importance. Victory for Spurs in that game will leave both teams on seven points with a match to play.